We sync Sage Intacct Expense Types as Categories in Expensify by default if you are set up to export as Expense Reports. If you are set up to export as Vendor Bills, your Chart of Accounts will be imported as Categories. 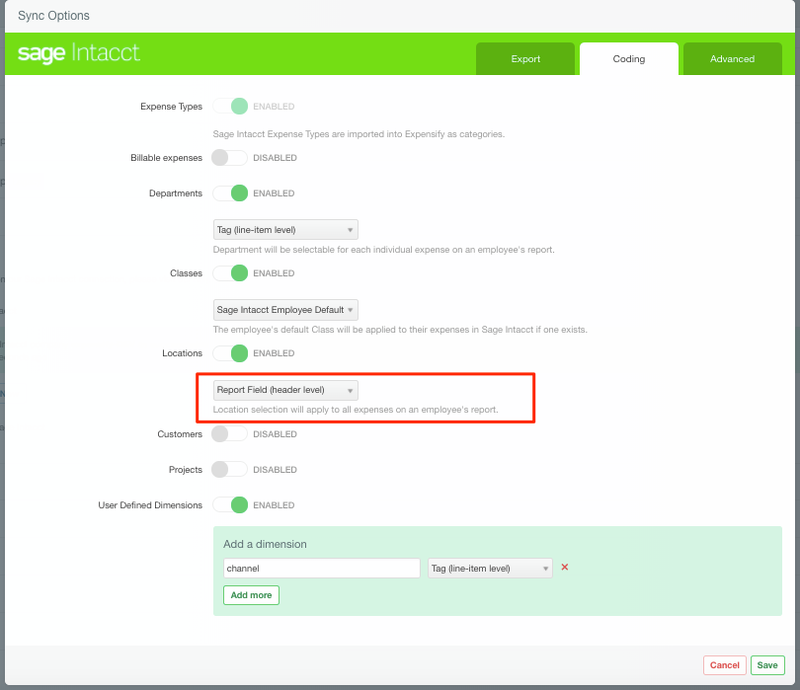 You have the option to hide specific Expense Types/Accounts from employee view by going to Settings > Policies > Group > [Policy Name] > Categories and disabling the toggle for a particular Category. Please note that each expense has to have a category selected in order to export to Sage Intacct. 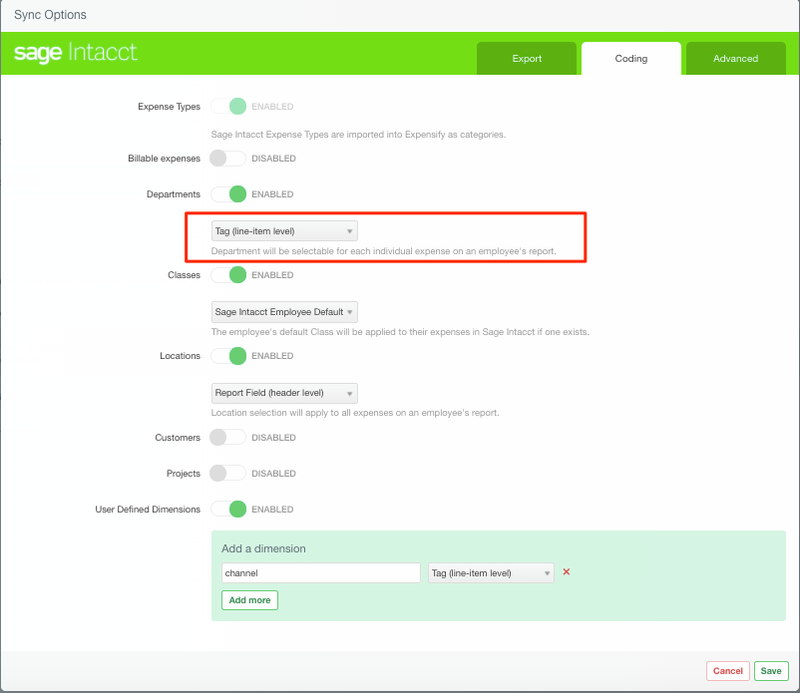 The selected category has to be imported in from Sage Intacct and cannot be manually created within the policy settings. 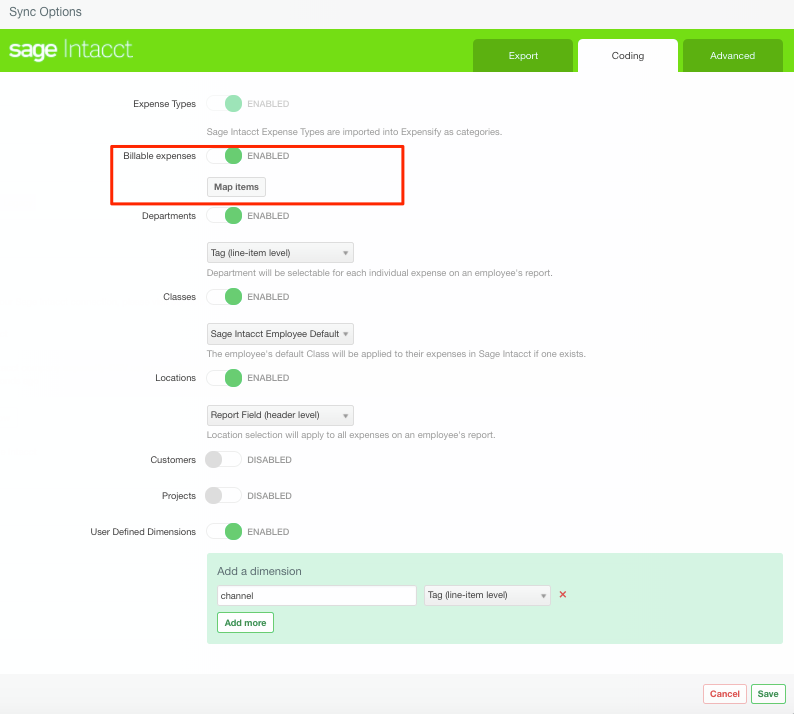 If you enable Billable expenses, you'll be able to map your expense types or accounts to items in Sage Intacct. 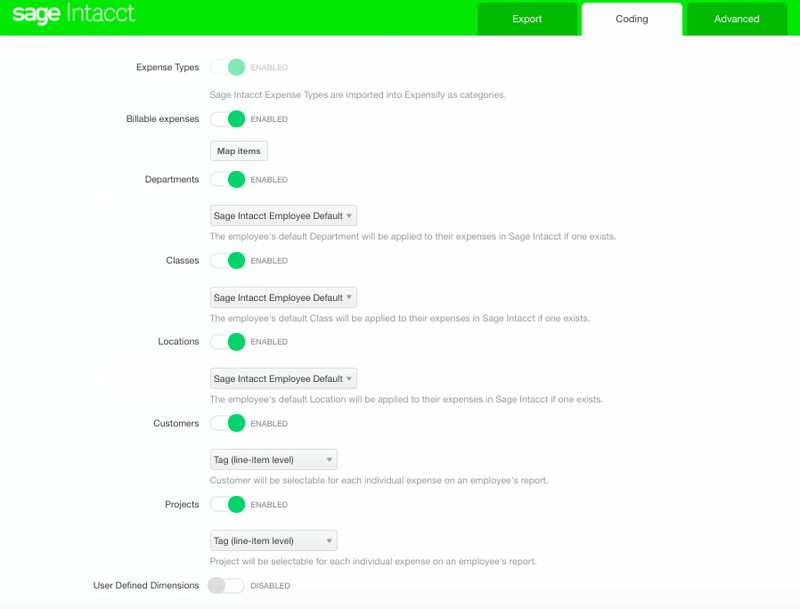 You'll then be able to map your categories (expense types or accounts depending on your export settings) to a specific item and these items will export to Sage Intacct. 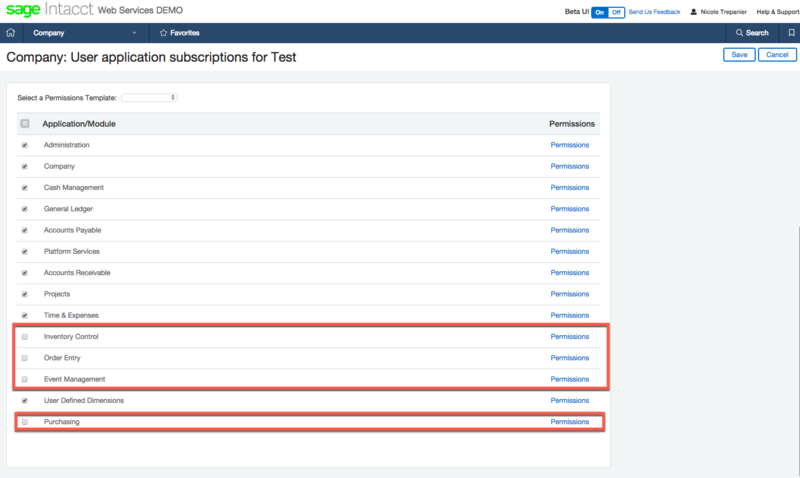 There are three mapping options for Departments, Classes, and Locations: Tags, Report Fields, and Employee defaults. You have the option to map Customers and Projects to Tags or Report Fields. 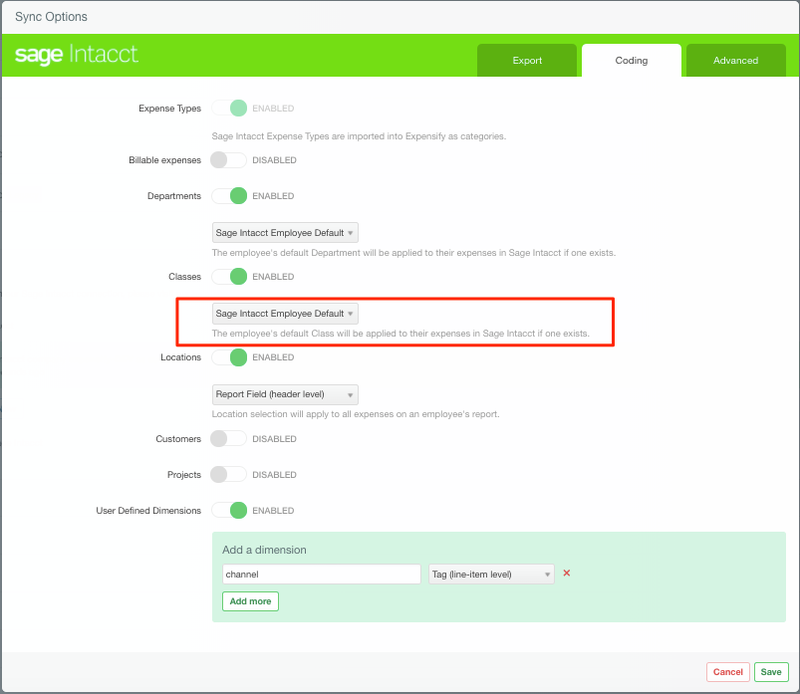 With the Employee Default mapping option, we use the default from the employee record when you export transactions to Sage Intacct. Please note, the Employee Default option is only available when reimbursable expense export is set to Expense Reports. 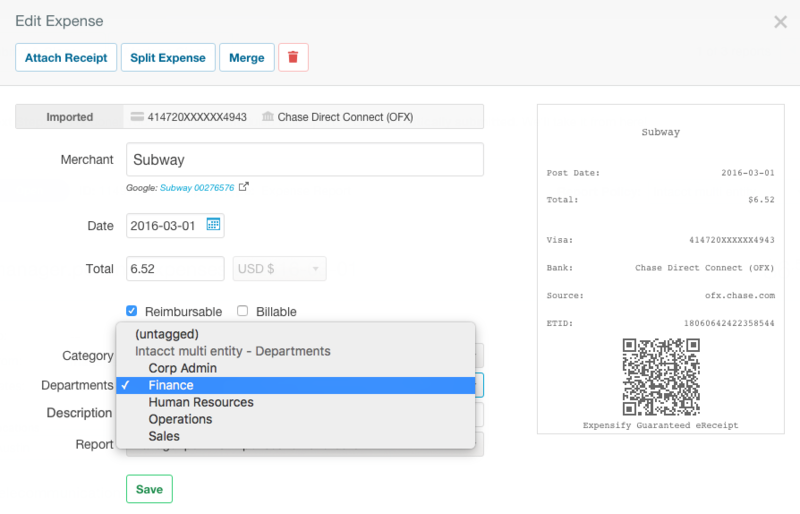 Tags allow you to have a different Dimension for each expense and should be used in the case where employees on the policy have to do a lot of cross charging between Departments or Locations, for example. Report Fields allow you to select one value for a particular Dimension that will apply to the entire report. Report Fields should be used in the case where the employee's Location, for example, is different from one report to another. 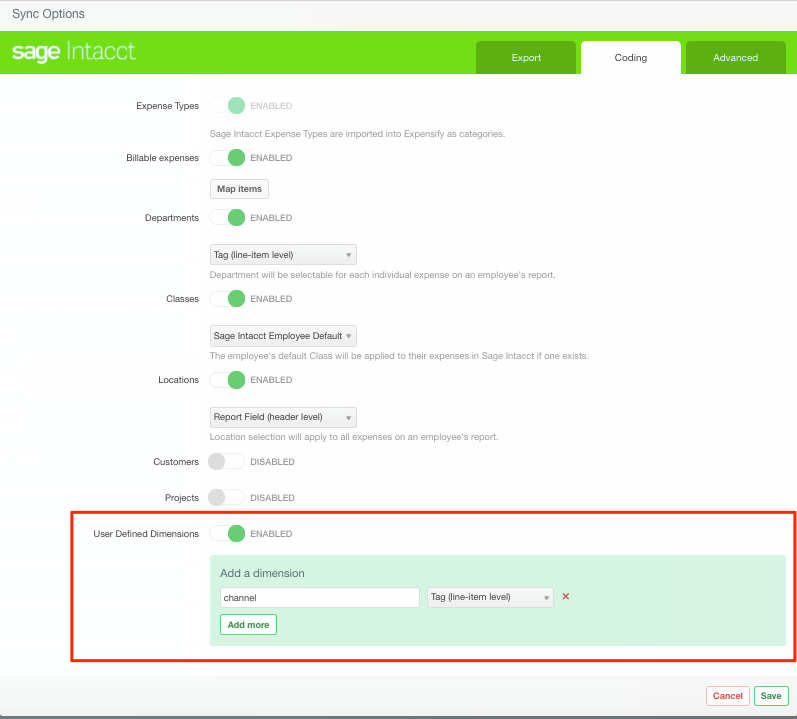 You can add any User Defined Dimension (UDD) to your policy by locating the "Integration Name" in Sage Intacct. Note: You must be logged in as an administrator in Sage Intacct in order to locate the required fields. To find the Integration Name in Sage Intacct, go to Platform Services > Objects > List > Set "filter by application" to "user defined dimensions". Now in Expensify, go to Settings > Policies > Group > [Policy Name] > Connections > click Configure under Sage Intacct. On the Coding tab, enable the toggle next to User Defined Dimensions. Enter the Integration name and choose whether you'd like to import into Expensify as an expense level Tag or as a Report Field, then click Save. You'll now see the values for your custom segment available under Tags settings or Report Fields settings in Expensify.